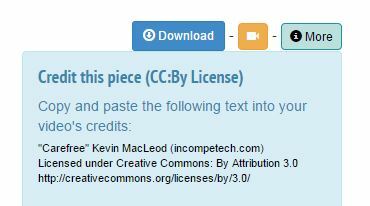 Inevitably at conferences or online people always ask, “Where do your kids get the music for their projects?” While there are many sites offering “free” creative commons music, my class usually only uses one–Incomptech by Kevin MacLeod. It is a site that has provided the music for 100’s of my kids videos. Many have the music cited properly as Scott has requested…and many, many videos do not because they were made when we were just starting with digital storytelling and simply throwing someones music into the background to perfect the video. Music is so important in videos. Try watching a movie without the music in the background. Try watching a video with fuzzy music and audio, or one with the improperly selected music. Can you imagine Star Wars without John Williams soundtrack? On Incomptech they can search by genre, feel, and can also see the beats per minute. They are easy to download and there is a spot where you can click and copy exactly what Scott would like in the credits. I love the cut and paste aspect of giving credit–it is easy to make sure the kids do it right. While I have never met Scott, I have this weird appreciation for what he has offered my class for free over the years. He has given my kids an easy way to make their videos sound more professional. He has added class to my class and doesn’t even know it. The other day while digging around on the site I noticed he is doing a Kickstarter campaign. Without asking my budget consultant I clicked on the pledge button (Aimee, it’s awesome karma, just take it out of the food budget line this month). I have really gotten to the point on the internet where I am now willing to pay for quality. Since Scott puts out quality work for free I think this is the perfect opportunity. I know I am not alone in using Scott’s work, just last week at Edcampseacoast a teacher featured the site during the smackdown. So if you haven’t used Scott’s site I highly recommend it. If you do use it please consider pledging to his Kickstarter Documentary. This post is not endorsed by him or the filmmaker, it is simply a post reminding you to used quality music in your kids videos, cite it properly, and give back when able (Shhhh–that’s not really true. I am actually writing it to attract the attention of the filmmaker hoping that he will interview one of my kids for the video to represent all the school kids out there using Scott’s music). Thanks for this. I also have public domain music you can use at http://www.radio-tom.com These songs are all out of copyright and my versions do not require any acknowledgement. Use them as you please. My music system on http://www.oz-rock.com helps total beginners to create their own music using special one-finger chords and backing tracks. Thank you so much for this, Paul. I had been looking for ways to source creative commons music, and this is just wonderful. Thank you! Exactly what I was looking for! Thank you so much for this site! I have looked for good, royalty-free music for classroom movies, podcasts, etc. I spent 40 minutes just now listening previewing and downloading tracks I like. I have to stop now or I’ll never get home. 🙂 I’m really looking forward to letting my students select some great background music for their projects. Why you say it’s royalty free and there’s nothing free there. Even when I try to buy a individual track for 9,95 as it shows in the website when I am about to pay it says $59,95. What is free? If I am have no answer as the last time I asked I will post it anywhere. Forget about it. Now I’ve read the infographic copyright 101. Thank you for the blog post. I had listened literally hundreds of free songs for my projects and honestly 99.5% of them are really useless. Now I found Kevin MacLeod and his Incomptech and I have been blown away by the quality of his work. Give a listen to our free download royalty free music for videmakers! Nice post ! i like your post . A wonderful site for some very unique royalty free music for filmmakers and video producers is http://www.freemusicpublicdomain.com all their songs are available for free download.